The Renault UE 57 is a French tier 3 tank destroyer. 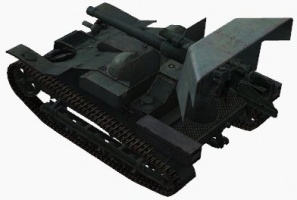 Often nicknamed "The Rat", the Renault UE 57 is currently The second Smallest "Tank" in the game (after TKS 20mm). Its most obvious features are its great gun choices, starting with the same gun from the FT AC. 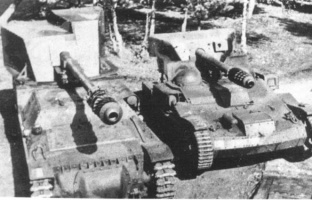 Its next 57mm is an excellent gun for its tier and can penetrate almost anything it comes across. However, its armor can't bounce anything, but if you get shots off on your enemy before they do they'll most likely be dead. It has a great rate of fire, though the elevation, traverse and depression of the gun are very limited. It's also a relatively fast tank, which is negated by its terrible traverse speed. In all it's best used to snipe from afar using its highly accurate and great gun, as you won't last long if you get very close to the front line. This tank is quite hard to play and is not at all rewarding, most of the time. If you have a good game then you have a great game, but these are few and far between. 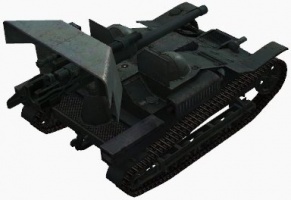 This tank will be a very, very hard grind, especially since you have to research the tier 4 through a second gun, which adds and extra 3,600 exp onto your grind. The Renault UE 57 leads to the Somua SAu 40. Best camouflage values in the game when stationary, as well as when firing and a very small silhouette. Contrary to its typically sluggish traverse speed, it can perform tight handbrake turns from high speed on a dime. 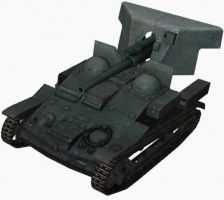 6-pounder gun can only fire AP and APCR rounds, and borders on inaccurate for a sniping role. The lightest tank in game at 2.7 tons; extremely vulnerable to ramming even by light tanks. It tends to rock on braking because of its light weight, making aiming difficult when stopping. Recently nicknamed the "Rat" as it literally can fit into even the smallest of hiding places without getting spotted and keep hitting the enemy with a very fast firing 6-Pounder Gun. 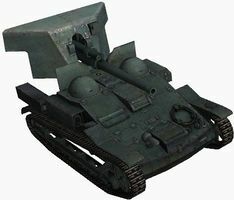 Its low profile greatly helps this tank as even the BT-7 will have to aim down on you once you are spotted. You have great accuracy, a good rate of fire, and a very good view range. Stay far back and wait for the enemy to expose themselves, then pick them off from long range. In maps where there are large open spaces, your 360m view range and very stealthy characteristics can let you serve as a great sentry, but otherwise, stick to sniping. Never let the enemy get in close. Your armor is paper-thin and you don't have that many hit-points, so you're extremely vulnerable to enemy fire. Also, you're so light in weight that ramming attacks will almost always kill you. Stay in the second line and try to keep some teammates between you and the enemy. DO NOT GO OFF ON YOUR OWN! Your speed and traverse are good enough to let you shift position in a hurry, but not good enough to keep you from being circled with ease if enemy tanks surround you. Your tank is very, very light. Although 100% worth it, equipment like a camouflage net, binoculars, ect. will give a noticeable downgrade in mobility. That said, equipment, especially the camouflage net, helps this tank immensely because it it already has excellent camouflage values; being a tank with one of the lowest profiles in the game. Unlike many vehicles in the game, your stock suspension has a very good load limit. Because of this, you don't necessarily need to research the suspension first. Researching the Renault ACL engine is inexpensive and worthwhile. The best strategy for researching might be to keep grinding to unlock the 6-pounder, using any free XP you manage to accumulate along the way to research the suspension and radio upgrades. Renault UE 57 was a prototype vehicle built by the forces of Free French Forces commanded by Charles de Gaulle in exile, while France was under German occupation. Developed in England 1943, the design was very crude, and it can hardly be justified even when taking into consideration the lack of funds and resources Free French Forces were suffering from. Essentially, it was a Renault UE artillery tractor with the small lightly armored superstructure on the rear of the vehicle. Main armament was to be British Six pounder, 57 mm anti tank gun which was at the time already obsolete. Only one prototype was ever built, which was to serve as a demonstrator for the eventual small series manufacture. After the disappointing trials, all further development stopped, and all production plans were cancelled. After cancellation the armament was removed, and the vehicle was converted back to the artillery tractor. This page was last modified on 8 November 2018, at 08:56.